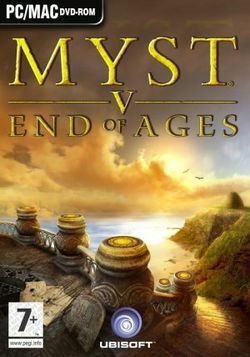 Myst V: End of Ages is the fifth and final installment in the Myst computer game series, and is a culmination of all the story lines from the previous games. The game was released on September 20, 2005. Like Uru: Ages Beyond Myst, the game was created by Cyan Worlds and published by Ubisoft. CEO of Cyan Worlds Rand Miller stated that "Myst V: End of Ages follows the Myst storyline to its conclusion — closing the book on the Ages of Myst". This page was last edited on 16 August 2016, at 17:36.